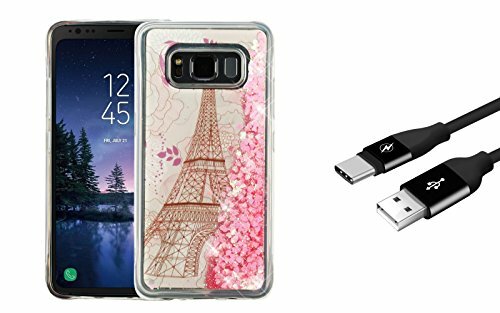 This accessory combo bundle pack kit is designed for the Samsung Galaxy S8 Active (SM-G892AZAAATT, SM-G892A, G892A, G892, SM-G892UZAASPR, SM-G892UZAATMB) on the AT&T Wireless, T-Mobile, Sprint networks. [Paris France Eiffel Tower Pink Hearts Dust Specks] Phone case is made of soft, durable, and flexible TPU (Thermoplastic Polyurethane) gel. Case is composed of extra fine glitter bling specks in a free flowing, floating liquid quicksand gel water. The protective phone case features an ultra-slim, thin fit, minimal, non-bulky design. Gel exterior provides excellent anti-slip grip on device. Provides excellent drop protection and helps cushion device from scratches and other damage. Precise openings and mold coverings on the protector case to allow full access to ports, camera, speakers and buttons. Sync or charge your USB-C compatible device to your computer with this USB Type-A to USB Type-C Charging Data Sync Cable. Featuring a reversible USB-C connector, it can be inserted into a compatible port in any orientation and the standard USB Type-A can be plugged into a wall power adapter for rapid charging. Made of hard protective PVC and soft flexible gummy gel PET. Durable cable can withstand 5000+ bends. Conforms to the USB Type-C specification that supports the maximum 2.4A safe charging and offers 480 Mbps data transfer speeds, perfect to charge or sync your smartphone, tablet, hard drive or camera to your Type-C enabled device. Bemz Depot Atom LED keychain light included. Comes with 3v watch battery.